Andy is a vice president and business banking relationship manager serving the Muskegon/Grand Haven Region. He has 11 years of banking experience, all of which is with Fifth Third Bank. Andy understands the challenges of running a business. He took time out of his banking career to help his family manage a 3-store boat dealership. As general manager, Andy gained valuable insight into what it takes to efficiently run and grow a small to medium size business. With his resources and financial experience, Andy brings a unique perspective to helping his clients reach and exceed their objectives. 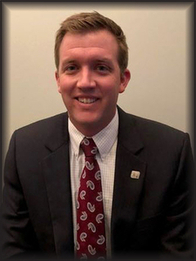 Andy has a bachelor’s degree in finance from Michigan State University and a Master of Business Administration from Grand Valley State University. He also graduated from Grand Haven Chamber of Commerce’s Leadership Connect personal development program. He resides in Muskegon, MI with his and daughter. They enjoy boating on Michigan’s waterways, Michigan State athletics, snowmobiling, traveling, and fishing. Andy also gives back to his community having volunteered for many non-profit organizations such as Wings of Mercy, Junior Achievement, Habitat for Humanity, and Ducks Unlimited.